The Canadian Tire gas rewards program offers patrons Canadian Tire Money for gas purchases. Rewards can be used in store, but not on gas. Only purchases made with use cash, debit or the Canadian Tire Options Mastercard earn Canadian Tire Money. The rewards otherwise earned by other credit cards are usually worth more than the Canadian Tire Money earned, making this program useless to most people. Rewards are earned based on the number of Litres filled, independent of the price per Litre or the grade of gas filled. Base earnings are low, but earnings can be increased by printing multiplier coupons, or using the Canadian Tire Options Mastercard. Canadian Tire gas bars offer a Canadian Tire Money as a loyalty benefit, which can be redeemed at Canadian Tire stores. The amount of Canadian Tire Money issued depends on the number of litres filled up. Purchases are only rewarded if paid for by cash, debit card or the Canadian Tire Options Mastercard. This severely limits the program. Few people will find value in this program because the rewards earned by using other credit cards outweigh the value of any potential Canadian Tire money. Those who are engaged with the Canadian Tire Money program or who know to print multiplier coupons prior to going to the gas station will get the best benefit out of this program. The Canadian Tire gas rewards program has little or no value to me. I carry the Scotiabank Gold American Express card that gets me 4% return on all my gas spending. However, using my credit card at the gas bar doesn’t earn any Canadian Tire money – they accrue only on cash and debit purchases, or those made with the Canadian Tire Options Mastercard, . At today’s gas prices, the Canadian Tire gas rewards will never match my credit card’s 4%, even if I filled 95 Litres and used an elusive 15x multiplier coupon on every purchase. Even if I didn’t have the Gold American Express card, I could have the no annual fee MBNA Smart Cash card, that would earn me 2% on gas purchases. I could have any one of the no annual fee cards on our favorites list and earn, at a bare minimum, 1% return on every purchase. Canadian Tire Money is earned based on the number of Litres purchased and is given when the gas is purchased using the Canadian Tire Options Mastercard, cash or debit. Canadian Tire Money is not given when other credit cards are used. Multiplier coupons range from 6x – 10x and are available for printing here. If you present the multiplier coupon when you fill up, you will get significantly more Canadian Tire Money than if you don’t. The multiplier coupons available vary, with an average of 7x, accoridng to the Canadian Tire Rewards website. If you have the Canadian Tire Options Mastercard, then you don’t have to fuss with bringing in coupons. You will automatically get the highest multiplier that is currently available. The amount of Canadian Tire Money given for any given purchase is based on the number of Litres filled and the multiplier. Filling up more gas is going to give you more rewards (as a percentage). Basically, at the 1X level, you get 2¢ for every 5 Litres purchased, with the exception that the first 10 Litres get no reward. Something to bear in mind is that the amount of rewards earned is based purely on the number of Litres filled. Most programs offer a higher return for the premium gas, but the Canadian Tire Money program does not. That means that the percentage return is actually lower when you fill a more expensive grade of gas (same rewards but higher spend on gas). Here is an example of how it would work for me. My normal fill up is about 40 Litres and regular gas is $1.40 / L for a total fill up of $56.00. 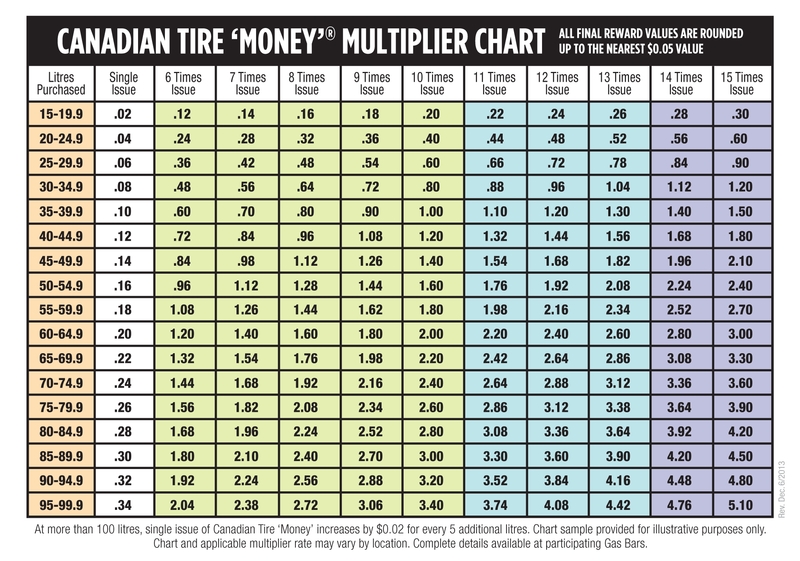 Canadian Tire says the average multiplier is 7X, so we will use that as the assumption. According to the chart, a base earning for 42.5L would get me $0.12. With the 7X multiplier coupon, I would earn $0.84 for my $59.50 purchase. Some math tells me that is a 1.4% return. 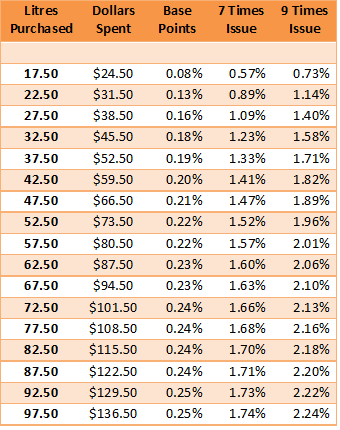 Here is a chart for the returns based on gas at $1.40 / L.
Remember, though, that I had to use cash, debit or the Canadian Tire Options Mastercard, so I was unable to earn the rewards I might have earned had I used my credit card. Canadian Tire Money can be used on anything at Canadian Tire stores, so for people who shop at Canadian Tire, this could be almost as good as cash back. The Canadian Tire Money cant be used to buy gas in the future, though. If you fill gas, but never shop for anything in the store, this program will not be valuable to you. In general, the Canadian Tire gas rewards program can have some value for people who shop at Canadian Tire and pay for gas with cash, debit or the Canadian Tire Options Mastercard. In comparison to other programs, though, the stated restrictions limit the value of the program to a large segment of the population. 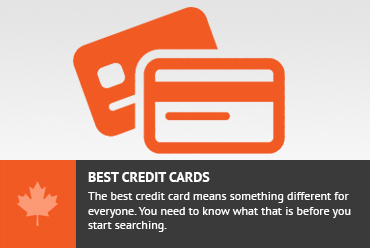 I would suggest that most people would do better to carry the right credit card that privileges all gas purchases. Use that credit card and forgo the Canadian Tire gas rewards program entirely. Aeroplan Basics – Classes of Service Best use of American Express Membership Rewards for a flight to Asia? 5 Simple Hacks For Cheap Cineplex Movie Tickets Esso Extra Points: Are They Worth It? Don't subscribe All Replies to my comments Notify me of followup comments via e-mail. You can also <a href='https://www.creditwalk.ca/comment-subscriptions/?srp=3211&srk=2648578ecea05c83754707575dc5a494&sra=s&srsrc=f'>subscribe</a> without commenting.